Konservatoriets Koncertsal, in the most central part of Frederiksberg, is a beautiful 3-floor concert hall that has been listed as a protected building in Copenhagen since 1994. You can see why when you enter the place. With wooden interiors and a beautiful organ, the building instantly challenges Operaen as the most beautiful venue Mew’s music has been performed at in Denmark – and in my opinion, it won as well. 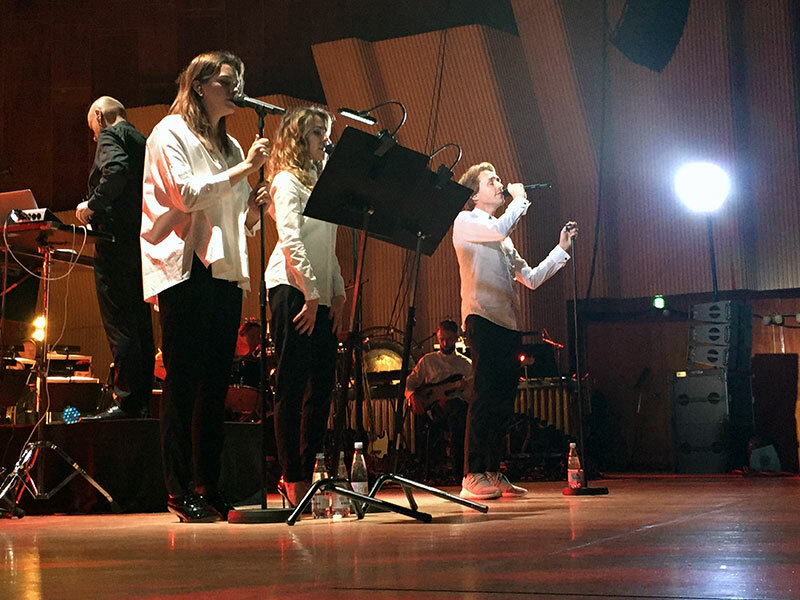 It is a fitting comparison because 60 Minutes of Mew was the first time since the Opera gigs that a concert was something different – a special evening. Had Mew been able to bring a classical orchestra when they were playing through the years, they probably would have done it. Jonas Bjerre once explained how the by now canonical visuals of animals joining Mew on stage to catapult the audience into their comforting-catharsis, was exactly a way to compensate for the lack of actual violins. Again the concert in Operaen springs to mind, with the orchestral intro of an animal orchestra. 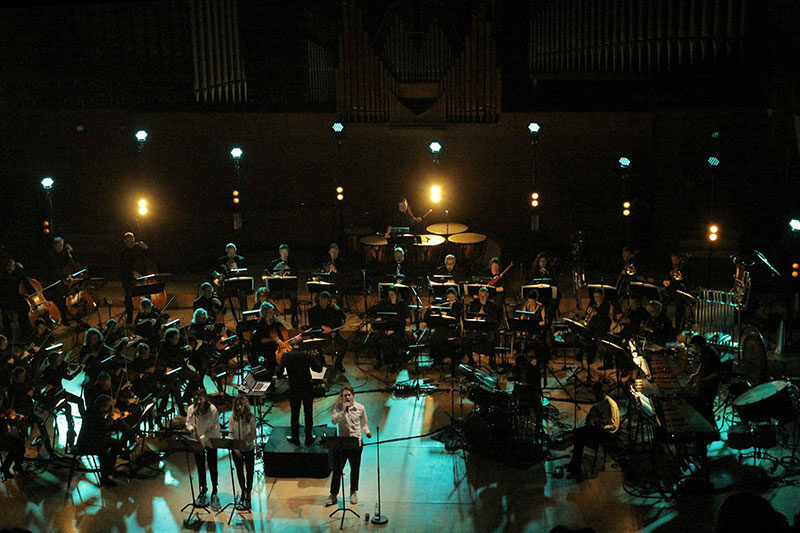 Despite the visuals ending up being a justified feature on their own, there can be little doubt after that Mew would have wanted to bring a live classical orchestra had it been possible. Because that is truly what they are. They are not pop songs, but pop compositions. And yet, the match is even better than that. Mew have always been grandiose maximalists. Sit back and listen to Silas the Magic Car one more time. It is the song that was clearly supposed to be laid back and humble. A small intimate song. What do you end up with? An amount of layers so big that any child learning to count could lose faith in their math abilities. Followed by an album-ender that picks up the melody again and thrust it with synths big enough to leave the atmosphere. And we love them for it, don’t we? One big group of sentimentalists cherishing a band of sentimentalists. Seriously, it applies to you too. There are not a lot of better ways to have get emotional or maximalistic than with a 45-person orchestra, two choir singers, a lovely venue, Mew themselves and a back catalogue that should have plenty of options to do something interesting. After a small introduction from the musical director of Copenhagen Phil – and much in Mew fashion – a little special composed intro that let the musicians of the orchestra tune their instruments to the sounds of a sea of clock-ticking noises and synths, the three members entered the stage. The show started out with a version of Making Friends that would showcase what kind of concert it’d be. In the center of the show were the compositions. Not Mew or the orchestra. And so, Johan Wohlert and Silas Graae often had long periods of silence and seemed slightly more like part of the orchestra playing their part when it made sense for the compositions rather than the main attraction of the evening. Some Danish reviewers have criticized the concert for that – that they ended up becoming side acts in their own show. I do not quite buy the premise. It is a about the music to me – not a narcissistic count of minutes of how often Johan would strike his bass strings. From the very start of the show, the goosebumps started arriving. Hearing these songs with such a fine detail of dynamics in a venue with superb acoustics was astounding. Jonas’ vocals have never been so clearly detailed live as they were here. That also highlighted whenever he was struggling a bit with high notes and on some songs they chose to take down his a vocal melodies an octave – whether this was a compositional choice or not, we can only guess. Making Friends was followed by Satellites – two songs that seemed natural to perform with their synth strings, harp and marimba. I was more surprised when they started playing Water Slides, as this is one of the simplest of their songs, and one that one would not naturally have chosen for an orchestra. It gained a lot of the dynamics between verse and chorus however, which was interesting. To my big surprise Rows completed the beginning + – section of the concerts. With its Steve Reich-like ending and huge amount of layers, it is one of those songs that you would want an orchestra to play – and to me it worked perfectly. I was ecstatic by the end of the song. And then the concert turned into a next level Mew experience for me. A raw hard-hitting version of Louise Louisa caught me totally off guard, with the beautiful rhythms of Silas being mimicked by the entire string section. The climatic drum solo has never sounded bigger or more beautiful. As if this was not enough, they followed it with An Envoy to the Open Fields. I would argue that song is the most complex Mew song along with Beautiful Balloon and the reversible set of New Terrain/Nervous, and they have unfortunately never really been able to pull it off live in a way that really made it sound as intimidatingly great as on And the Glass Handed Kites. Well, until this concert. My heart started pounding so hard and and this point I was more like one big goosebump with feelings of nostalgia attached to it, trying to catch its breath. My sentimentalism exposed by the 170 bpm breath, that had the person sitting next to me worrying about me. White Lips Kissed finished of the Kites section with its rich possibilities to do string arrangements before Mew left the stage to much applause. The encore consisted of new single Carry Me to Safety, a song which honestly hasn’t really caught my interest too much. After the second of the two shows, that was the melody that stuck with me. Growing. Comforting Sounds pretty much sounded like what you would expect – grandiose. 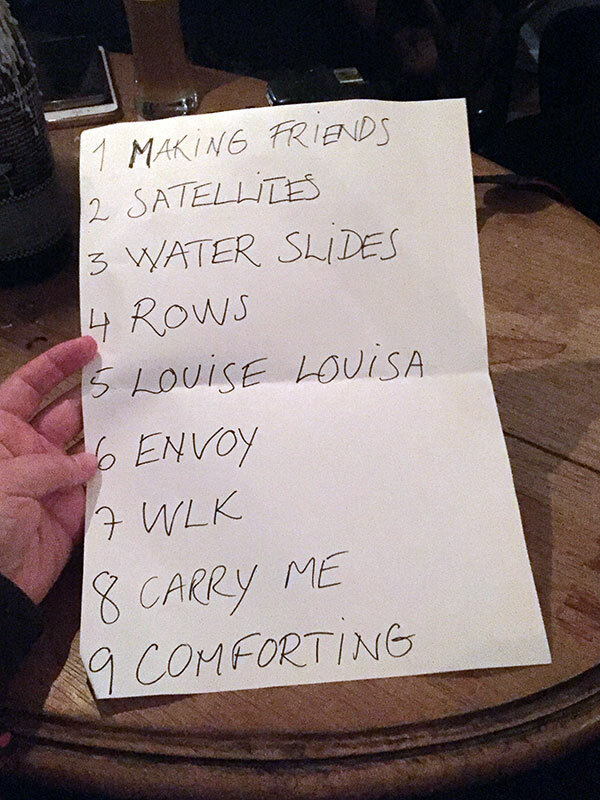 I had a conversation the day before the show that revolved around which songs they were likely to play. With only 60 minutes according to the title of the show, the participants of the conversation firmly agreed that there would be no Rows, seeing as Comforting Sounds was impossible to get around and a teaser had already surfaced from the rehearsals with that. Also, it was firmly believed that Am I Wry? No and 156 would most likely make in into the set. Because they always do, don’t they? Last time I watched Mew in Copenhagen in Falconer Salen, I left the place disappointed, because they seemed like a band unwilling to take risks or renew themselves. It seemed like a band clinging onto a beautiful formula that was conceived around one and a half decades earlier. It was predictable. For the same reason, I was really looking forward to this concert, as it would have to feel different than what a Mew concert had felt like for so long. 60 Minutes of Mew was the antidote to that feeling. I would have laughed loudly at any person who would have told me that I would ever get to see Rows, Louise Louisa AND Comforting Sounds in the same concert, even more if the person told me the concert was only supposed to be 60 minutes. Not a single No More Stories… song. Hearing the songs shaken up with different sounds was just what I needed to hear. I felt challenged for the first time in a Mew show since I-don’t-know-when. The sounds, compositions and setlist were actually impossible to guess. I wish going to Mew a concert always felt like this. This and the acoustic concert in London, which I unfortunately did not attend, has made it clear to me that Mew might have been to afraid to take chances in latter part of their career. They ought to take big chances with both their sound and performances. Taking these chances will throw some people off and it will pay off greatly with others. And so it was clear that some people did not enjoy this orchestral experience very much. Personally I rate it up there among my top three best live experiences with Mew among the close to 30 concerts I have witnessed. Last time I was this surprised and touched might very well have been my first Mew concert at Roskilde Festival in 2005, which was the experience that makes me finish the words of this article. Think about it again – with an international indie breakthrough. Who would go out and make an album that dark and which runs as one continuous piece? That is bold risk-taking. Who would make a song that is supposed to play both ways production-wise? They essentially survived production suicide. Mew are greatest when they are unpredictable.